"And when amnesty is granted to the 12 million illegals, as GOP senators are preparing to do, that should advance the death of the GOP as a national party by turning Colorado, Nevada and Arizona blue, and putting even Texas in play. "Why should the half of America that pays no taxes but survives on federal benefits vote for a party that will cut taxes they do not pay but roll back benefits upon which they do depend? The most viable alternative to BO & the Democrats is the Republican Party & it is dying right before our eyes every day. Thank heavens Republicans held on to control the House after the last election but even @ that there were over half a million more ballots cast for House Democrats nationwide than House Republicans. Thanks to our Founders for conceiving our electoral system. In 2012 gerrymandering did not hurt either. The obvious problem in America is that not only are people of substance outnumbered but that the Democrats have figured out under BO's treacherous talent how to organize people under the Alinsky method into voting for things that are not in their or the country's best interest. BO's Democrat political campaign organization has not been turned off since 2007 & continues today non-stop under Organizing For Action with the express intent of destroying & erasing the GOP as a national party – see RTE posting of March 5 for complete details re OFA. 1. Tax Simplification & Reform – This topic is something Republicans bring up yet half of the citizenry does not pay income tax & @ least another 20% don't pay enough income tax that the subject is of any interest to them either. My former congressman used to try to reassure town hall audiences by telling them he was fighting to preserve their home mortgage interest deduction when statistically two thirds of the audience did not take the deduction & even if they did they had to overcome the amount of the standard deduction before any itemized deduction was of value to them. He thinks this is a winner because he has been in Congress for eighteen years telling the same yarn to people whose level of sophistication is believing in home mortgage interest deductions & tax refunds. In any event, if Republicans propose any more than tinkering around the edges of the current income tax code Democrats will come out in force with the millionaires & billionaires not paying their fair share class warfare line that has worked so well against Republicans. Enacting the FairTax is the answer to so many of our problems but it is lost on the people & is of no concern to the great majority of politicians whose life styles are doing fine without it. 2. Homosexual Marriage – With approval of homosexual marriage growing rapidly so that already it has over 50% support Republicans have a numbers problem again in that only 27% of Republicans approve of it. To combat this former Republican Party Chairman Ken Mehlman is trying to make a new softer Republican image by showing support for overturning the California ban of homosexual marriage. The political balance is trying to grow the party membership without losing the base. What is missing from the Republican strategy is what is in the best interest of the country like totally eliminating state-controlled approved marriages. 3. Replacing ObamaCare - Republicans can talk a good talk about repealing & replacing ObamaCare which we know will not happen in the next four years - but its implementation can be weakened & slowed. Ten thousand baby boomers are retiring every year (that's one every eight seconds turning 65) plus ObamaCare will bring another 30 million people into the insured ranks. The Association of American Medical Colleges predicts there will be a shortage of over 60,000 doctors by 2015 & 140,000 by 2025. This provides some hope for Republicans in that with the right presentation they can turn the tide against Democrats who continue to support ObamaCare. 4. The Sequester – The sequester remains the only spending cut mechanism in Washington if evidenced only by the cancellation of the White House tours which everyone is aware of. BO's budget released yesterday replaces the sequester with tax increases & spending cuts that will appear eight to ten years from now – meaning they will never be realized. BO continues to make the most onerous cuts he & his cabinet can think of. Republicans best chance on this is to point out the poor choices BO makes & offer alternatives like Senator Coburn has done. This issue could turn into a winner for Republicans. The above four problems plus gun control provide Republicans @ best a mixed bag to make headway against BO's socialist onslaught designed to destroy America's well being. BO has put carbon taxes on the back burner because he knows that the real killer of the Republican Party is to convince Congress to pass a comprehensive immigration plan. As indicated above by Pat Buchanan comprehensive immigration is the issue that will be the death knell for the Republican Party as a national force. Participating in the same type of discussions that are over ten years old calling for the tired old "enforce our borders first...pathways to citizenship...& learn English" slogans will not carry the day for Republicans no matter how nice their tone. For instance when the Associated Press recently announced that they will no longer use the term illegal aliens comedian Jay Leno quickly (& correctly) remarked that it won't be long before these people will be known as undocumented democrats. Never mind that the Immigration and Nationality Act (INA) of 1952 broadly defines an immigrant as any alien in the United States & a lawful permanent resident as a resident alien & an illegal alien as one who entered the United States without inspection. BO wants the media to keep watering the terms down until they sound totally innocuous. 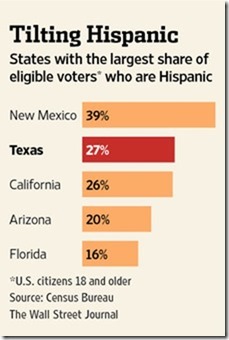 The above graph indicates that Texas had the second largest percentage of Hispanic voters in 2012 & of course that share will be growing in future elections. Since many Hispanics in Texas have never voted Democrats think of them as a vast community organizing resource project that is wide open to be developed. In 2012 I calculate that approximately 3,000 Texas Democrat volunteers worked on Florida voters to vote for BO. These volunteers have now returned to Texas to organize the Hispanic vote there & pilot runs show they are successful. The high energy San Antonio Mayor & Democrat Party keynote speaker Julian Castro estimates that Texas will be competitive in six to eight years. By 2016 alone there will be approximately one million more eligible Hispanics to vote. Some conservative commentators love to quote the one way U-Haul trucks coming from California to Texas – unfortunately many such transplants bring their statist voting habits with them. Republicans working on immigration reform don't realize or ignore that the majority of illegal immigrants have never been interested in becoming American citizens. After the 1986 amnesty only 40% of the 2.7 million immigrants who received permanent legal status had become naturalized citizens by 2009. Source – DHS study in 2010. And the reason is simple – the current pathway to citizenship is not easy. Just for starters the immigrant has to pay a $680 application fee & pass an oral exam in English covering American history & government. Illegal immigrants who send a substantial amount of their earnings back to relatives in Latin America are not interested in paying $680 for something they do not value or studying to answer questions in English like "how many amendments does the Constitution have" or "when was the Constitution written?" Republicans need to define the problem accurately & properly – illegal immigrants want to work here, preferably legally to ensure no deportation, but citizenship & its requirements are not part of their plan. It is ironic that a recent poll showed two thirds of Americans favor a pathway to citizenship for illegals with jobs but as indicated above a majority of those in a position to apply don't. Seems like we would be better off if everyone just minded their own business. In any event BO's community organizing Alinsky machine plows ahead to convert Texas to the Democrat Party side in the very near future. Does the country need further deterioration before enough people realize that taking both our freedom & work ethic for granted was a very big mistake? So many of our problems started when the compassionate social safety net turned into breakfast in bed seven days a week for people who found it easier to game the welfare system than to go to work. The country changed as the national incentive changed from thinking the sky is the limit for your potential to you are a fool if you are not taking advantage of every government program that your neighbor tells you he has applied for. Jobs are not as important as they were just a decade or so ago because people have found they can patch together an existence consisting of part time employment doing menial work, benefits from a government program or two, & spending down whatever wealth may have been accumulated. Such people feel a hopelessness that is contrived by BO's design that can only be reversed by a Galt-like figure who can re-deliver prosperity & clearly explain what we are in the process of throwing away. Doug - Thanks for well analyzed job assessing political prospects. Please note that there may be some hope as ObamaCare implodes. Then free market capitalists as myself should take full advantage of that. How? Cite again how socialism never works and champion free markets as never before. Get involved! Blog and write letters to Leftist media, strongly support pro free market politicians, even consider running yourself. Link below details how ObamaCare is imploding.